The rug is beautiful with vibrant colors and add a wonderful touch to the room! 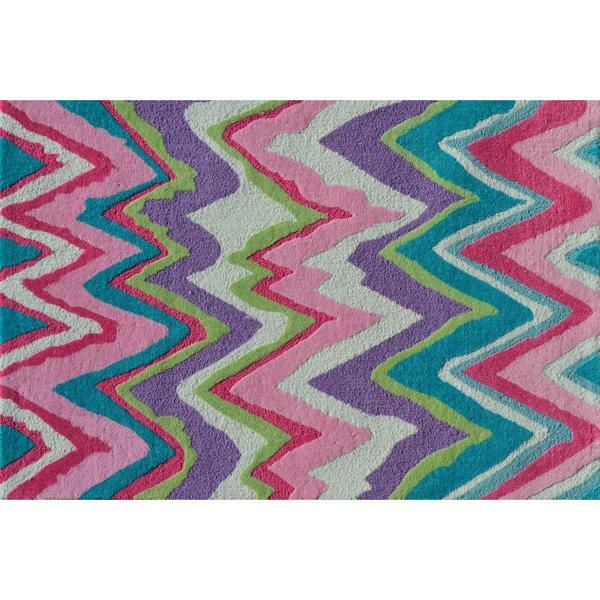 nuLOOM Handmade Kids Stripes Area Rug - 7' 6" x 9' 6"
Crafted of fine polyester, this Hand-hooked Chevron Girl Pink Polyester Area Rug has rich colors to enhance your interior decor. With a hand-hooked construction and plush pile, this rectangular rug brings flair to your home with its geometric design in pink. This collection of nursery room baby rugs are designed in playful colors and patterns. Classic and versatile, they make the perfect blend of style and comfort just like this Chevron Girl Rug. Looks just like the photo. Super quality and adds just the right amount of color to a room.